Links: Goodreads | Author's Website | Buy the book! Lola Nolan is a budding costume designer, and for her, the more outrageous, sparkly, and fun the outfit, the better. And everything is pretty perfect in her life (right down to her hot rocker boyfriend) until the Bell twins, Calliope and Cricket, return to the neighbourhood. When Cricket, a gifted inventor, steps out from his twin sister's shadow and back into Lola's life, she must finally reconcile a lifetime of feelings for the boy next door. I recently just read Anna and the French Kiss and I LOVED it! Literally right after I finished Anna, I was racing over to my bookshelf to pick up Lola! - I couldn't get hooked on this book, It took me a while to get into it. - I did not feel the romance as much as I did with Anna, it didn't make me get that cute feeling inside when something adorable happened. - I did not feel attached to some of the main characters. Another thing that I really LOVED about this book is that Lola's parents are gay. We don't see enough of gay couples in contemporary books and I think that there should be more! Lola wouldn't be the same amazing person if it weren't for her dads! I rated this book a 4/5 stars! 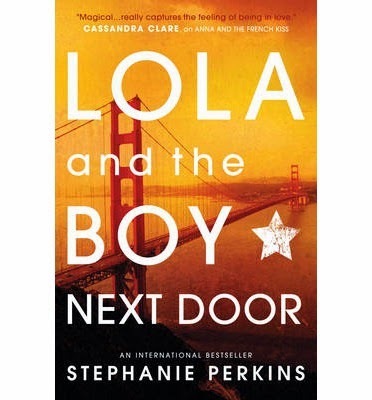 If you have not yet read Anna and the French Kiss or Lola and the Boy Next Door, I definitely recommend it! These books are super adorable and are such a light fun read. I liked this one even less than Anna too because of the romance. I just can't stand characters that cheat and so didn't really enjoy being in Lola's head.